I have a strong preference for giving readings by email – rather than by phone, chat, video or a face to face – having practiced these various methods. I am writing this blog post to outline a few of Benefits Of Email Readings. 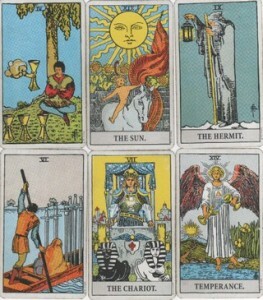 When you receive a tarot reading by email, you receive valuable information, that can be referred back to at any time. There are often many levels to a reading, which cannot all be perceived immediately. So, unless a reading is recorded in some way, vital pieces of wisdom and guidance, both for the present and future, could be missed. It’s just not possible to absorb all the information at immediately. Other ways of receiving a reading. Often a phone or chat reading is priced by the minute and can prove quite expensive (when I used to give phone and chat readings on tarot lines, I was acutely aware of the charges mounting up as the minutes ticked by). I prefer giving readings by email, as I communicate more effectively through the written rather than spoken word. Also, I can take my time over a reading, without the external pressure of a client’s need for an on the spot answer. I need to be quiet and undisturbed in order to meditate deeply whilst giving a reading. I find that adding pictures of the cards, also helps to clarify the interpretation for the client. If you would like to experience the benefits of email readings, please click here to order your tarot reading from me.